When Cheryl Ramberg Ford was a UO undergraduate, one of her most influential experiences was performing research with the mentorship of faculty members. Now, with her husband Allyn, she has made a $7 million gift that will kick-start renovations of Pacific Hall, the UO’s original science building. Their gift will add new labs, enable recruitment of new faculty, create similar research opportunities for future generations of students, and boost the UO’s research mission. Opened in 1952, Pacific Hall supported cutting edge research in the natural sciences and provided a top-notch facility for the science of the time. 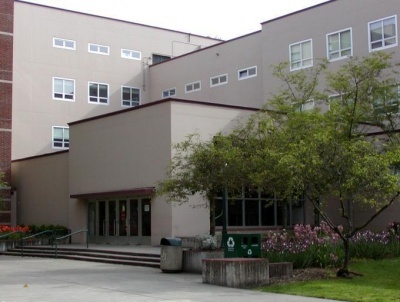 As more recent buildings and labs have been designed to facilitate interdisciplinary approaches, Pacific Hall has been repurposed for other fields. The number of science majors at the UO has grown by 72 percent since 2000. The spike, coupled with an increased university focus on enhancing research excellence, has created high demand for modern lab space, more faculty members and new undergraduate research opportunities. In turn, mentored undergraduate experiences can inspire new generations of young scientists to pursue careers at the edge of discovery. Complete plans for Pacific Hall include the restoration of the south wing to its original scientific functions while facilitating cross-collaborations. The Ford’s lead gift will fund renovation of science labs — the foundation, and most important part, of this extensive construction project. The first phase recaptures most of the space in the basement, first and second floors of the building’s south wing for use as modern laboratory space. When complete, it will house 14 new laboratories, staffed by teams of scientists, faculty members, postdoctoral scholars, graduate students and undergraduate researchers from a range of fields. When the full renovation is complete, Pacific Hall will create a grand entrance to the group of modern buildings on the west end of campus known as the Lorry I. Lokey Science Complex. It will feature the restored Pacific 123 lecture hall and a commons area that will serve as a fertile gathering and connection place for students, faculty members and scientists. The project represents the next step for the university’s long-term investment in science and research infrastructure that began in the 1950s. Its most recent addition was the opening of the Robert and Beverly Lewis Integrative Science Building in 2012, the first such facility in the state. The drive to heighten the university’s research profile is a key priority for Schill, who points to the intrinsic benefit of research in helping solve society’s most pressing problems and creating greater levels of innovation and economic development for the state. Cheryl Ford has served on the UO Foundation Board of Trustees, completing her term June 17. She has served as president of the UO Alumni Association Board of Directors and currently serves on the board of the Jordan Schnitzer Museum of Art. Allyn Ford is a member of the Board of Trustees of the University of Oregon and previously served on the Oregon University System board. The Cheryl Ramberg Ford and Allyn Ford Alumni Center is named in recognition of the couple. In addition to the Ford Alumni Center, their philanthropic contributions have supported programs campuswide including athletics, the art museum and more than 750 scholarships to the UO funded by the Ford Family Foundation.